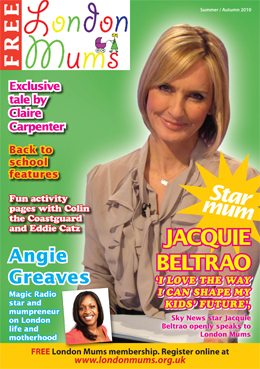 Click on the magazines’ images to download a PDF of all of the London Mums Magazine back issues. Spring is in the air and the brighter days bring positive energy. My two interviewees are gorgeous and talented: global singing sensation mezzo-soprano Katherine Jenkins talks motherhood and her latest album ‘Guiding Light’ while mumpreneur and former Strictly winner Abbey Clancy shares her tips for achieving a work life balance with us. The good weather makes me want to go out and on adventures. In my travel feature I take you to the gorgeous slopes of Alpe d’Huez in France which have been a very pleasant discovery and made fall in love with skiing again after 30 years (don’t you dare calculating my age!). In this issue you’ll find a few interesting education features too. Schooling is a sensitive topic, after all. Ranulph Tees tells why tutoring can be a force for good if done right while Stella Bataille explores the challenges of raising a bilingual child even if you can’t speak the language yourself. London Mums’ first aid contributor Emma Hammett explains what it means for our kids having first aid training as a mandatory part of the curriculum in UK schools. Last but not least London Mums’ globetrotting reporter Rita Kobrak shares her favourite Italian recipes inspired by her life at Villa Radicata in Tuscany with us. Autumn and Winter might bring dark days but my interviewees will bring light and sparkle to your life. Alesha Dixon with her Lightning Girl book is a ray of sunshine, not to mention Hollywood heartthrob Andy Garcia and iconic 80s pop singer Paul Young. They all inspired me with their tremendous talents and kindness. In a heart-warming and funny interview Alesha Dixon opens her heart about motherhood, her first laugh-out-loud superhero novel, female role models, guilty pleasures and a few BGT behind the scenes stories. The London Mums’ shopping pages are crammed full of Christmas gifts for kids and parents from toys to books. For additional gift ideas check out London Mums’ dedicated site http://londonmumsmagazine.entstix.com where you can get up to 60% off tickets for West End shows and lots of London attractions. The mums I have interviewed for this issue have done extraordinary things in their lives. Their stories are inspiring and positive. I don’t often interview the same people twice, but I have made an exception for Sophie Kinsella who holds a special place in my readers’ hearts for making us laugh with her bestsellers, including the hugely popular Shopaholic series as well as a sweet and funny new children’s series called Mummy Fairy and Me. Hippychick founder and mumpreneur Julia Minchin reveals her secret path to success by building a popular brand. In conversation with London Mumpreneur and founder of the Honest Mum blog and brand Vicki Psarias, she talked about her first book Mumboss and the challenges of building a successful mummy blogger business. This year’s first issue includes stories that focus, one way or another, on the most meaningful things in life. How we approach ourselves to diversity in our society, how we teach our children to face the difficulties life throws at us with mindfulness, how we carve our space in the world without fear of not conforming to stereotypes are some of the topics I discussed with three of the most inspiring actresses of our generation: Julia Roberts, Sally Phillips and Kelly Macdonald. With both Julia Roberts and Sally Phillips I talked about issues of disability and diversity while discussing their latest family movies Wonder and Ferdinand. Scottish star mum Kelly MacDonald opens up about her bedtime stories and her role as nanny to Christopher Robin, the boy who inspired the Winnie the Pooh books. You can watch all my interviews on our YouTube channel www.youtube.com/londonmums In conversation with London Mumpreneur and founder of First Aid for Life Emma Hammett, she revealed the importance of learning first aid to save lives. Last but not least, our globetrotting reporter Rita Kobrak gives us tips on how to travel with baby and shows us how to enjoy La Dolce Vita in sunny Tuscany in two special travel features. Finally, as always at the beginning of a new year, I highlight toy trends for parents who want a hint of what will turn out be the new craze in the world of play. 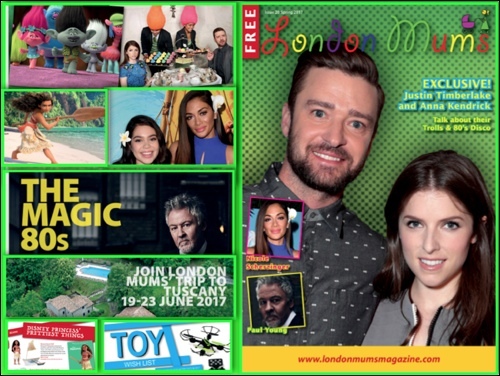 The London Mums’ shopping pages are crammed full of all things trendy, playful and fun from toys to gadgets. For additional gift ideas check out London Mums’ dedicated site http://londonmumsmagazine.entstix.com where you can get up to 60% off tickets for West End shows and lots of London attractions. 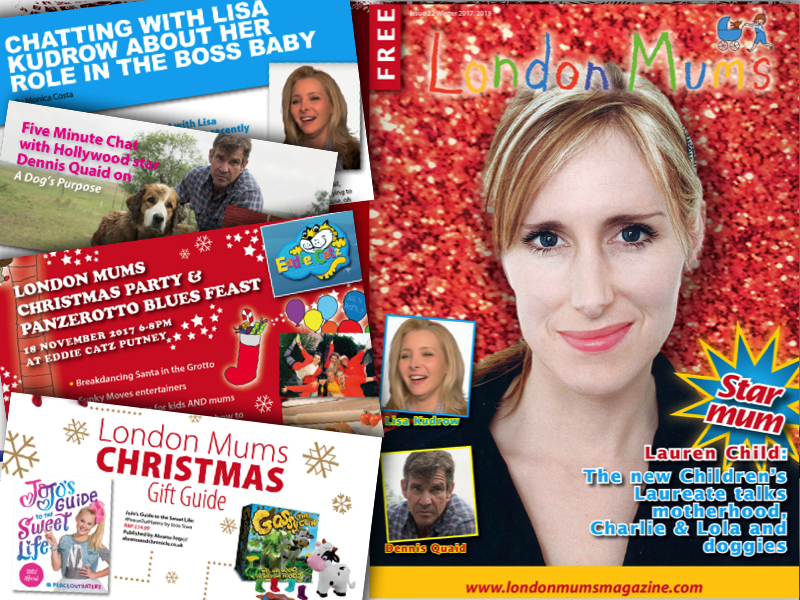 For this Christmas issue I have interviewed some of the loveliest people in the world: Charlie & Lola author Lauren Child and Wimpy Kid’s writer Jeff Kinney, as well as Hollywood legends Dennis Quaid and Lisa Kudrow. In an exclusive chat Lauren Child told me all about her favourite doggies and her daily challenges parenting her adopted daughter Tuesday. I talked about dogs also with Hollywood legend Dennis Quaid who took five minutes off his busy schedule to tell me a few behind-the-scenes gossips from his emotional movie A Dog’s Purpose. To keep up the good spirit I could not find a better person than comedian Lisa Kudrow, star in sitcom Friends and more recently The Boss Baby. She spoke about voicing the boss baby’s mum in this hilarious animation. And because it’s good to laugh out loud, I met Wimpy Kid’s author Jeff Kinney when he was in town to promote the funniest family film of the year, Diary of a Wimpy Kid: The Long Haul. You can watch this interview on our YouTube channel www.youtube.com/londonmums In conversation with London Mum & star author Alice Tait, who designed our logo for the past three issues, she revealed how the British Capital inspires her stories and illustrations. In the lead up to Christmas, I love staying indoor except for when I join my ladies’ football team for training to prepare for our Sunday League matches. And believe me, if I can do it, every mum can too. Read a letter from the lady behind the best Ladies Football League in London, Jo Farmer, for true inspiration. Last but not least, you can find out why I had the time of my life during my week in Tuscany last Summer in my special travel feature. The London Mums’ Christmas shopping pages are crammed full of all things trendy, playful and fun from toys to gadgets. For additional gift ideas check out London Mums’ dedicated site http://londonmumsmagazine.entstix.com where you can get up to 60% off tickets for West End shows and lots of London attractions. And who better than star mum and Hollywood royalty Reese Whiterspoon to make us all happy in our special chat about her role as yummy mummy Rosita in the animation Sing. I could not miss the opportunity to interview Sing writer and director Garth Jennings who reveals more exclusive behind-the-scenes gossips from this masterpiece by Illumination/Universal (the same filmmakers behind Despicable Me 3 out soon). Former tennis champion and London mum Annabel Croft tells me her predictions about Wimbledon 2017, her views on fashion on the tennis court, how to deal with teenagers and her tips to be successful in sport. Check out more celebrity interviews on our dedicated YouTube channel www.youtube.com/londonmums including a recent one with handsome British actor Luke Roberts as well as US author Jeff Kinney (Diary of a Wimpy Kid). Last but not least, you can find out the latest Summer essentials in the London Mums’ shopping pages filled with lots of inspiration for trendy toys, games, party supplies, travel and camping essentials. For additional gift ideas check out London Mums’ dedicated attractions’ site http://londonmumsmagazine.entstix.com where you can get up to 60% off tickets for West End shows and lots of London attractions. This London Mums Spring 2017 magazine issue is a happy one. Spring is in the air and who better than Justin Timberlake and Anna Kendrick talking about their Trolls and 80’s Disco music to make us all happy and positive after a gloomy 2016. In my exclusive interview they tell me a few behind-the-scenes gossips from their latest roles in Dreamworks’ animation comedy Trolls. Nicole Scherzinger, the stars and filmmakers from Disney’s Moana reveal lots of anecdotes from a movie destined to become a classic Disney animation. To be in tune with our 80’s theme iconic pop icon Paul Young talks about the Magic 80s & bringing his stretchy pants back for his 80s Invasion Tour 2017. Check out details of London Mums’ relaxing trip to Tuscany week commencing 19 June 2017 and how you can join too. Don’t miss out Travel with kids feature on fun activity holidays in stunning Tuscany for all the family. The London Mums’ shopping pages are filled with lots of inspiration for baby essentials, toys, trendy gifts and films. For additional gift ideas check out London Mums’ dedicated attractions’ site http://londonmumsmagazine.entstix.com where you can get up to 60% off tickets for West End shows and lots of London attractions. 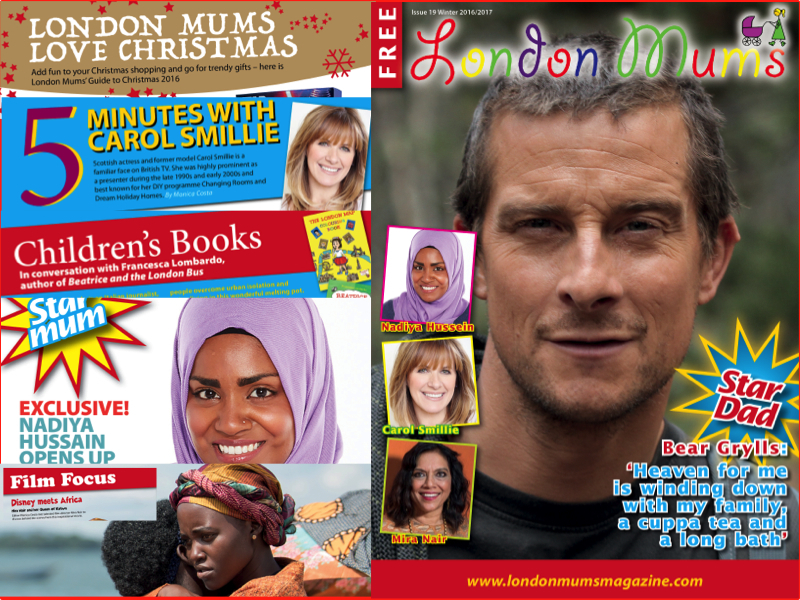 This London Mums Winter 2016-2017 magazine issue is a special one for our team as we feature an exclusive interview with Britain’s most beloved Dad, Bear Grylls, in which he tells us all about his parenting skills and a few behind-the-scenes gossips from his adventures. Scottish TV presenter Carol Smillie speaks about her latest entrepreneurial venture, the Diary Dolls, a pioneering range of pretty clever underwear for young women who might be worried about heavy periods whilst at school, playing sport and sleepovers. In conversation with Francesca Lombardo, author of Beatrice and the Bus, we discuss her educational children’s books aimed at helping young people overcome urban isolation and enjoy living in this wonderful melting pot. Her series ‘Beatrice and the London Bus’ was voted by London Mums as the ultimate kids’ novels based in London. UK’s most trusted GP Dr Anshumen Bhagat tackles children’s problems with allergies in our popular Ask the Doctor’s section. Last but not least, you can find out why we believe that Nadia Ivanova is a Fashion brand to watch in 2017. The London Mums’ Christmas shopping pages are filled with lots of inspiration for trendy gifts, toys and films. For additional gift ideas check out London Mums’ dedicated attractions’ site http://londonmumsmagazine.entstix.com where you can get up to 60% off tickets for West End shows and lots of London attractions. 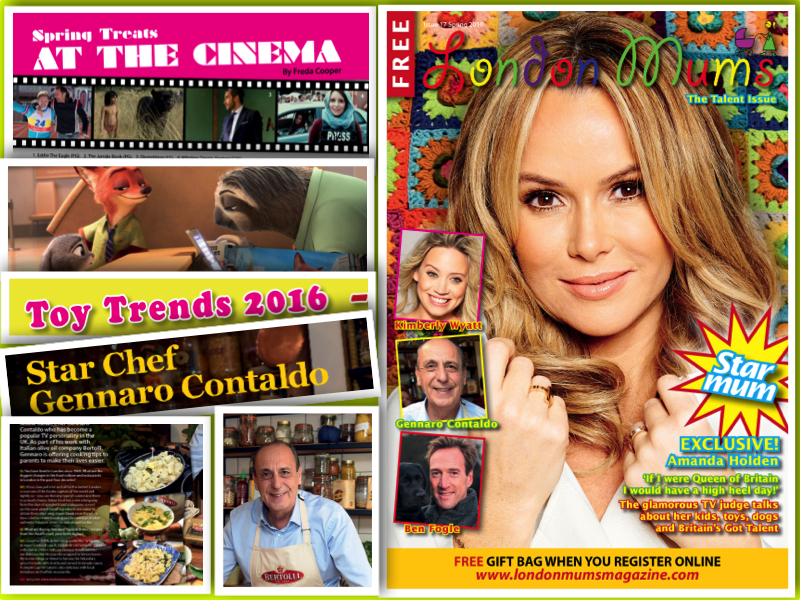 This London Mums Summer – Autumn magazine issue is dedicated to Hollywood stars! We are excited and honoured to have two of the world’s most talented artists, Johnny Depp and Jon Favreau, who discuss their latest film roles. We have also caught up with Olympic champion Rebecca Adlington who explained us why she prefers motherhood to sport competitions. 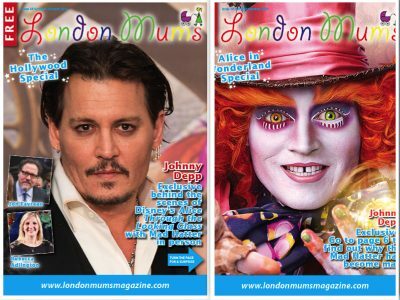 This London Mums Spring magazine issue is dedicated to talent! Our cover interviews are with two very talented female artists, Amanda Holden and Kimberly Wyatt who discuss their work commitments, family and a few other gossips. Amanda is truly hilarious and incredibly familiar. Talking to her about her kids, toys, dogs and Britain’s Got Talent, feels like having a chat with your best mate. Former Pussycat Doll Kimberly Wyatt talks about how she helps girls get active and motherhood. There’s no better place than Disney to talk about talent in action and I went behind the scenes of new animal talking comedy adventure Zootropolis with film directors Byron Howard and Rich Moore. Talent is abundant in Star Chef Gennaro Contaldo’s cooking. In this interview, he reveals his top pasta tips and his favourite dishes. Dog loving talent, TV Star and London Dad Ben Fogle opens his heart on his love for Labradors and his children. The London Mums shopping pages are filled with lots of inspiration if you want to upgrade your Spring wardrobe, if you are looking for affordable items to entertain kids over Easter and trendy toys. 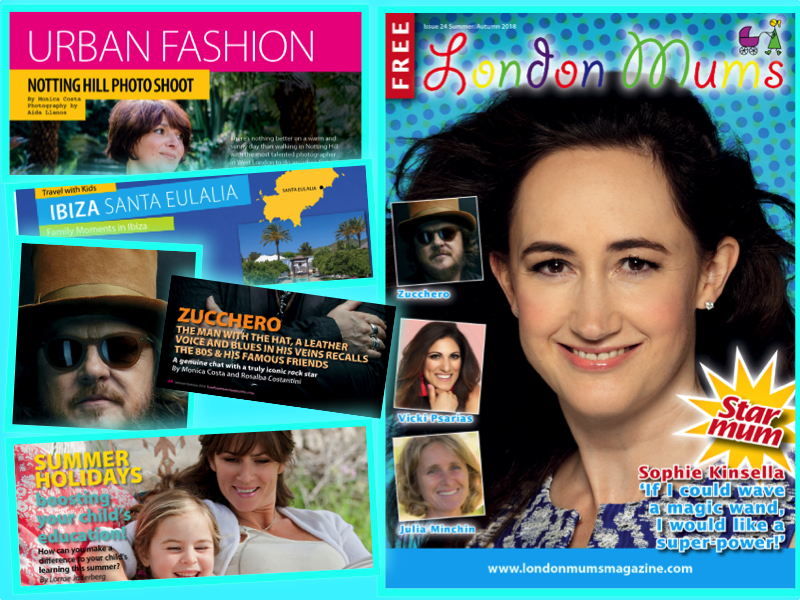 This London Mums Winter / Christmas magazine issue is dedicated to all Shopaholics out there and what better way of do it then with an exclusive chat with Mrs Shopaholic in person Sophie Kinsella, author of the chick-lit Shopaholic novels. 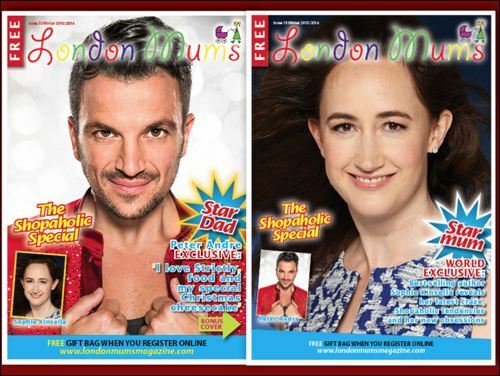 For the first time we also have a Star Dad on the front cover, Popstar and Strictly Come Dancing revelation Peter Andre. They both bring glitz and glam to our special double cover issue. We could not choose between Sophie and Peter for the cover so we have placed them on the cover back-to-back. 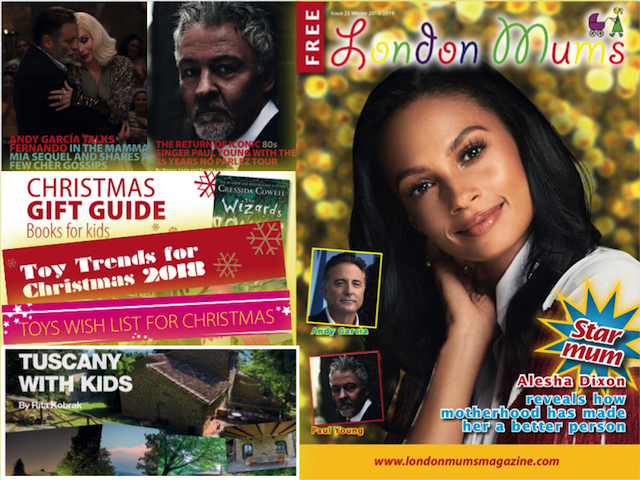 Other magazine highlights include film critic Freda Cooper’s reviews of the family movies for this Christmas, an insight in the new Bratz dolls and lots of Christmas Gift pages filled with lots of Shopaholic inspiration for your seasonal shopping and beyond. Shopaholics also take a trip to Italy and show you how to enjoy La Dolce Vita. But London Mums also do serious stuff and to prove it to you our child reporter Diego and I took a first aid course and reported back on how it all went. Enjoy reading our Shopaholic issue as much as we have enjoyed making it! 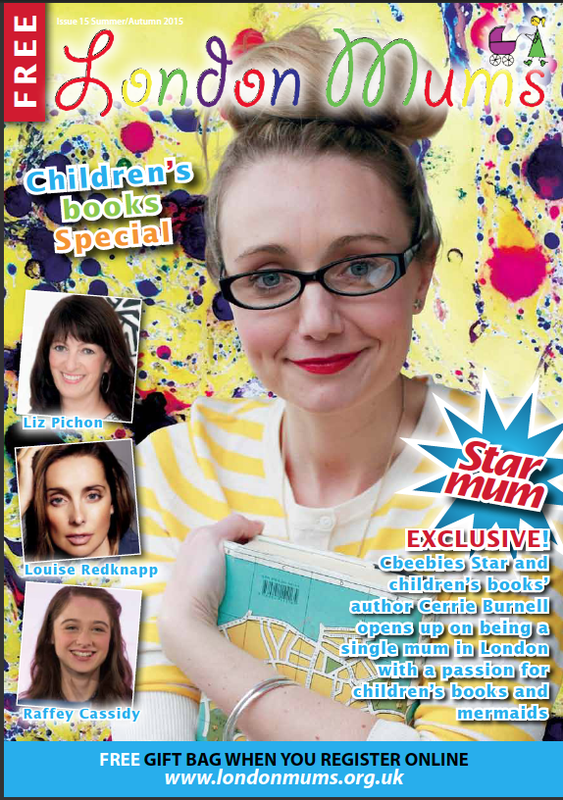 The London Mums Summer magazine issue is dedicated to children and to inspirational children’s books’ authors including Cbeebies’ presenter and writer Cerrie Burnell and Tom Gates series’ author Liz Pichon. Other magazine highlights include film critic Freda Cooper’s interview with rising movie child Star Raffey Cassidy, parenting expert DR MIRIAM STOPPARD Agony Aunt column and Dr Adam Fox’s article on how to fight allergies this Summer. Last but not least, you will love my five-minute chat with glam pop star and footballer’s wife Louise Redknapp who told me her secrets to family happiness and eternal beauty. 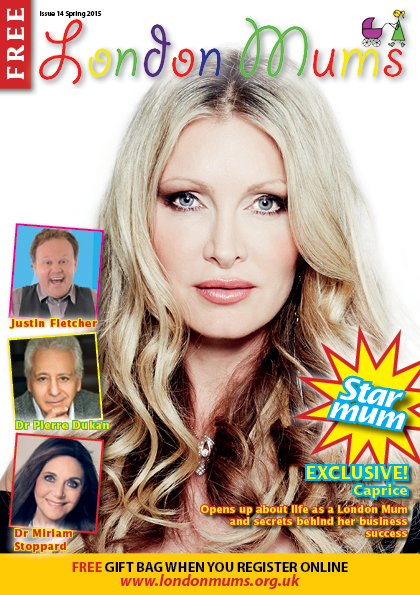 Exclusive interviews with Glam Model and Mumpreneur Caprice, Aliens Love Underpants bestselling and award-winning duo Claire Freedman and Ben Cort, Cbeebies star Justin Fletcher, Dr Pierre Dukan and Dr Miriam Stoppard. 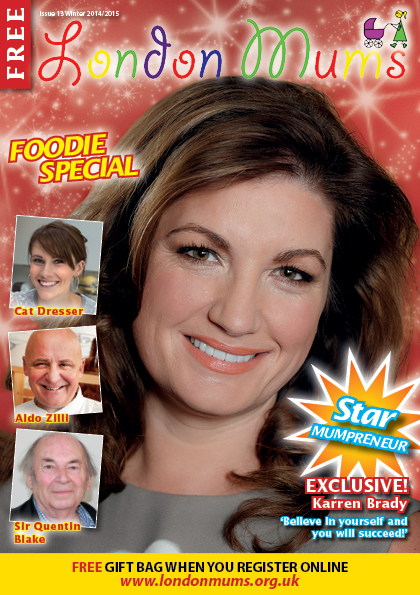 Exclusive interviews with The Apprentice Star Mumpreneur Karren Brady, Illustrator Sir Quentin Blake, Celebrity Chef Aldo Zilli, The Great British Bake Off star mum Cat Dresser, TV Dr Ellie Cannon. 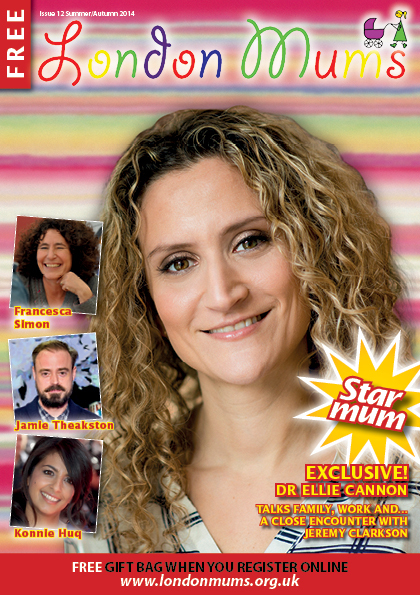 Exclusive interviews with TV Dr Ellie Cannon, Horrid Henry’s author Francesca Simon, TV and radio presenter Jamie Theakston, TV Super Mums Konnie Huq and Katie Hill. Exclusive interviews with British TV star Holly Matthews, Iconic baby photographer Anne Geddes and new children’s author Sally Green. Exclusive interviews with Desperate Housewives star Teri Hatcher, Strictly Come Dancing star and Rugby champion Ben Cohen, actress Tamzin Outhwaite and former Apprentice Winner Tom Pellereau. 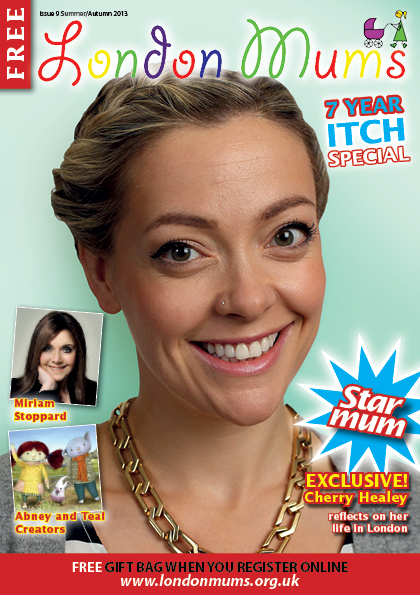 Exclusive interviews with Cherry Healey, Miriam Stoppard and the Creators of Abney and Teal. 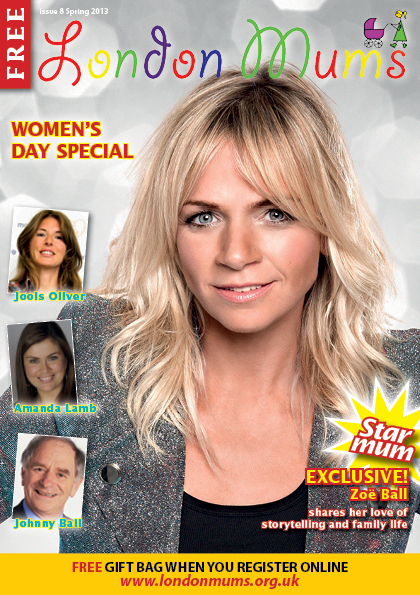 Exclusive interviews with Zoe Ball, Johnny Ball, Jools Oliver and Amanda Lamb. Exclusive interviews with Jenny Falconer, James Cracknell, Arlene Phillips and Lowri Turner. 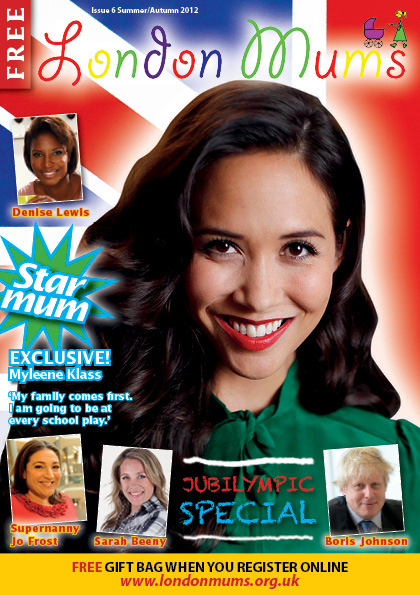 Exclusive interviews with Myleene Klass, Denise Lewis, Sarah Beeny, Mayor of London Boris Johnson and Jo Frost. 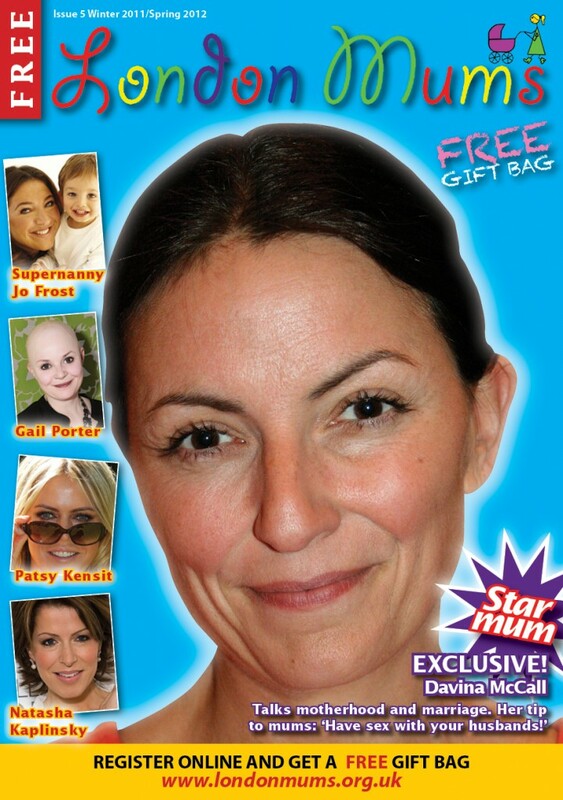 Exclusive interviews with Davina McCall, Gail Porter, Patsy Kensit, Natasha Kaplinsky, Jo Frost.